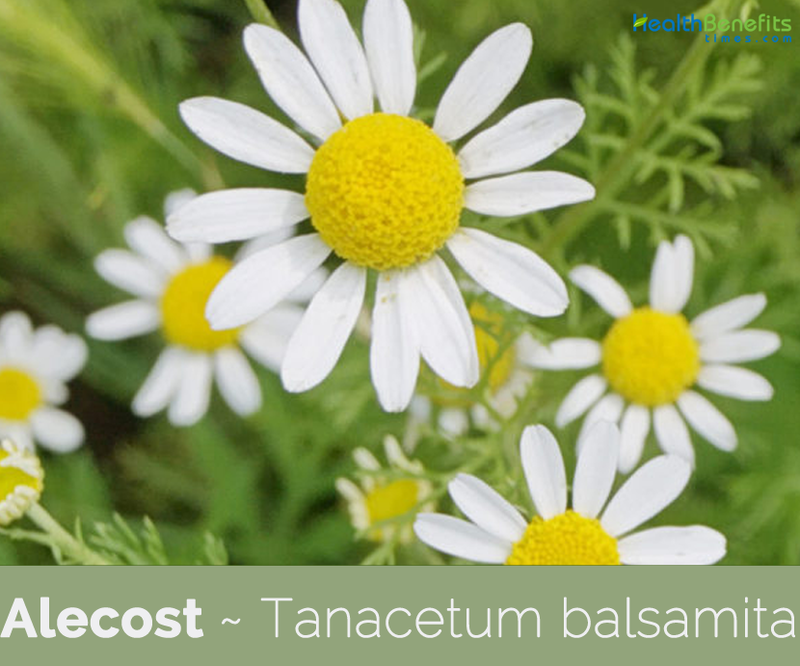 Tanacetum balsamita commonly known as Alecost is an attractive tall growing, perennial herb, belonging to the Aster family, the Asteraceae ⁄ Compositae. 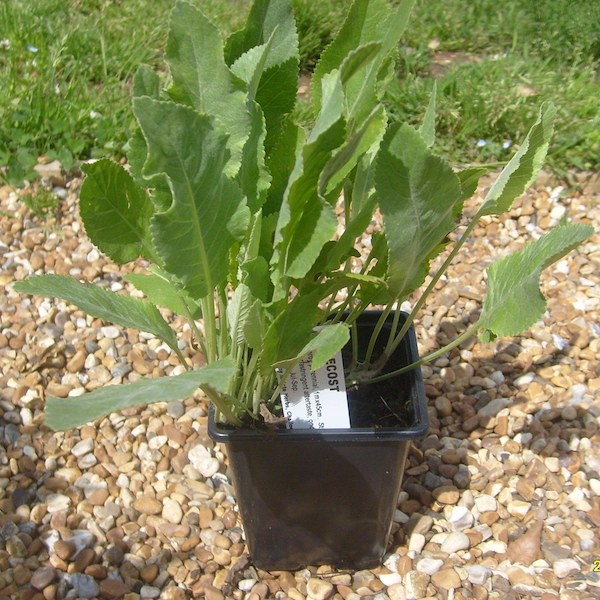 This aromatic herb has two popular common names, ‘Costmary’ and Alecost. ‘Cost’ refers to Costus, a spicy Asian plant related to ginger, which has a slightly similar flavor. ‘Mary’ refers to a legendary association with the Virgin Mary, perhaps due to the fact that this herb was used in medieval times as an infusion, taken to relieve the pain of childbirth. The plant is native to southern Europe and western regions of Asia and is a hardy plant that is able to withstand the cold winters of Europe as well as the humid summers in Asia. Few of the popular common names of the plant are costmarie, sweet Mary, mintys mair (Mary’s mint), alespice, lady’s balsam, lady’s herb, bitter buttons, goose tongue, allspice (not to be confused with the spice), sweet tongue, tongue plant, balsam herb, mint geranium, mace (not to be confused with nutmeg mace), Bible plant and Bible leaf. In medieval France costmary was called “Herbe Sainte-Marie”, but other references recognize it with Mary Magdalene as often as the Virgin Mary. According to medieval legend, costmary was the balsam with which Mary Magdalene washed Jesus’ feet. 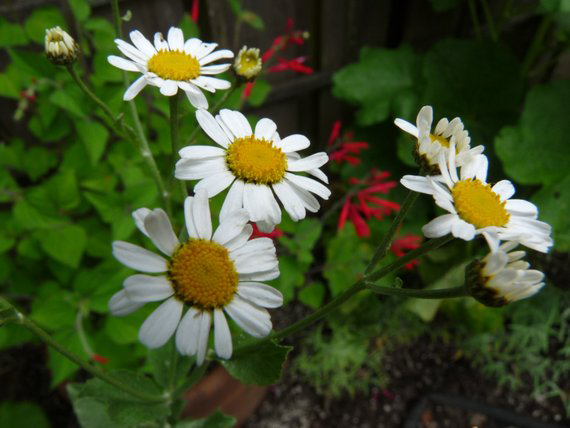 Genus name tanacetum refers to the family relationship with tansy and species balsamita derives from Latin balsamum “balsam tree”, originating from Old Hebrew bōshem denoting the balsam tree, but also meaning “fragrance” or “spice” in general. The plant has occasionally been mistakenly called “mace “in English, this term being reserved for a spice derived from the nutmeg tree. Alecost is an attractive tall growing, herbaceous, perennial, rhizome bearing herb that grows up to 2 m (6.6 ft.) high. The plant thrives in nearly any type of poor, dry soil, including clay and sand. The plant has shallow in depth, wire like, slender and branched roots. Stem is solitary, erect, loosely pubescent, and branched above. 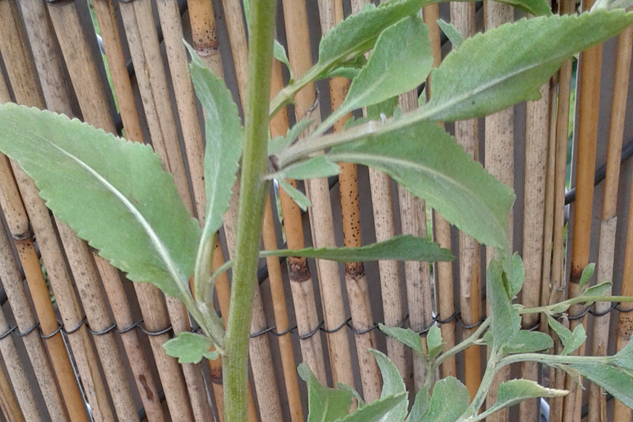 Basal leaves are 12-20 cm long, limb oval-elliptic, 1-1.5 cm wide, crenate-dentate, acute, loosely pubescent, sessile, and sometimes pinnatisect. Petiole is 8-15 cm long. The leaves have a minty, balsam-like fragrance reminiscent of the taste of spearmint chewing gum. Flowers are yellowish, button-like blossoms about 1½ inch wide that bear a resemblance to those of tans. The Alecost flowers bloom in various groups between the later phases of summer to early autumn. Flowering normally takes place from September to October. Flowers are replaced by achene 5-10 mm long, costate: pappus crown-like, 0.2-0.4 mm long, entire or dentate. The plant does not produce any seeds and are propagated by division or root and rhizome cutting. Alecost is a potential medicinal and aromatic plant grown commonly in most of wild habitats in Iran, Turkey and several other countries. 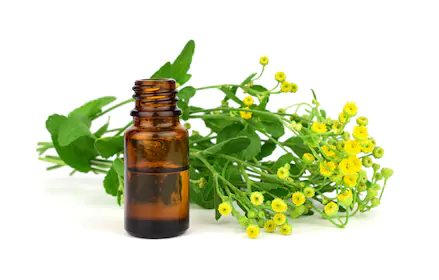 Its essential oil is presently used in medicine and pharmacology and several other industries such as food, perfumery and confectionery. Regrettably there is very little tendency to the large scale production of this valuable plant. There are very restricted literature and research works on Alecost as well. Inspite of this, Alecost can be used as a rich source of monoterpenes such as carvone along with carvone bearing plants such as spearmint, caraway and dill. It was taken to the New World by early English colonists who combined it with lavender to scent linens and blankets. It was also used in wardrobes and clothes’ stores to deter clothes moths. The dried leaves of alecost retain their minty-balsam perfume for a long time and make a sweet addition to pot pourris. A small amount of the leaf can be added to soups and salads, or added to melted butter and new potatoes. Alecost is recommended in modern herbals to relieve a stuffed-up nose. Place a handful of the leaves in a bowl of boiling water, cover the head with a towel and inhale for five to ten minutes. In flower language it is the symbol of impatience. Alecost also helps improve the health of the gastrointestinal system. Modern herbalists do not usually use Alecost ; however, it can be used to manage liver, digestive, and gallbladder disorders. As per the publication, a person can make a standard infusion by using 30 grams or an ounce of dried leaves or three handfuls of fresh to 570 ml or 2.5 cups and a pint of boiling water. The infusion is allowed to steep for between 15 minute and four hours and then strained for use. Also, the dosage used is up to 240 ml or eight fluid ounces per day, which is divided into three doses. Alecost can be used as first aid for minor injuries. The plant’s leaves can be crushed to relieve pain from bee stings, minor wounds, and burns. Also, the leaves can be made into an ointment, which is used to treat mild skin irritation, bruises, and blisters. Additionally, Alecost can be made into a tea, which can help sooth stomach upset, colds, and cramps. Alecost has astringent and antiseptic properties, which makes it proficient of treating ailments like colds, fever, flu, indigestion, worms, and diarrhea. Along with the above-mentioned, the ointment can also be used for old ulcers, dry itches, shingles, scabs, and external vermin. They have been used internally as an aperient in the treatment of dysentery, and as a remedy for liver and gall bladder complaints. Externally, they have been used as a salve to treat burns and insect stings. They are considered to be virtually outdated in modern herbalism. Strong infusion of the leaves to be good in disorders of the stomach and head,’ and much celebrated for its efficacy as an emenagogue. An ointment made by boiling the herb in olive oil with Adder’s Tongue and thickening the strained liquid with wax and resin and turpentine was considered to be very valuable for application to sores and ulcers. It is recommended for case of intestinal gas, flatulence and digestive disorders. Topical use in the form of oil with Alecost quickens wound-healing for small cuts and soothes superficial burn wounds and insect bites. 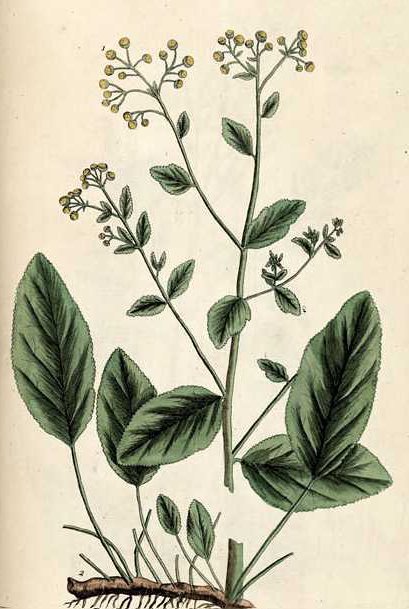 Alecost was used to treat an assortment of ailments, including diarrhea, liver, worms, colds, flu, fever, indigestion, gas, problems and to cure cerebral disorders. Many herbal medicinal practitioners have also recommended the herb to bring on delayed menstrual periods. Alecost ointment used for bruises, heals old ulcers, sores, dry itches, strains of veins and sinews, burns, the shingles, blisters, external vermin, and scabs. 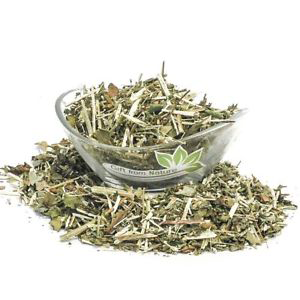 Alecost tea is also commonly taken with honey and cloves to relieve menstrual pain and cramps. Alecost alleviates fever and flu as well as cerebral conditions. Crushed leaves of Alecost are known to provide relief from the pain of bee stings and minor wounds and burns. Alecost inhalation helps to clear the nasal passages, therefore is a useful remedy for catarrh. It is used as a substitute of mint in iced drinks and can be used with fruits and cakes. Tea is useful for colds, upset stomachs and cramps and to ease childbirth. It was recommended against melancholy and hysteria as well as dysentery and against gallbladder disease. Leaves can be consumed raw or used as a flavoring in soups, beer etc. They can be chopped and added sparingly to salads. 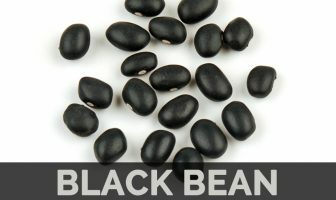 They have a very pleasant aroma, but can be overpowering in the food if you are not careful. Leaves were at one time widely used in brewing beer, before being superseded by hops (Humulus lupulus). Whole leaves can be laid in cake trays to flavor the cake whilst it is baking. Delicious tea is made from the dried leaves. Fresh leaves were also used in salads and in pottage, and dried are often put into pot-pourri, as they retain their aroma. Fresh chopped Alecost is paired with mixed salads, beef stew, green peas, potatoes and vegetable soup. Plant works well in various meat and seafood recipes, and may even serve as an alternative to other herbs such as mint and sage. Alecost goes well with tuna, egg and seafood dishes. It can be replaced as a sage. It is particularly good in carrot soup, as well as homemade beer. Plant was traditionally used for its insecticidal properties. Dried leaves preserve their fragrance well and so are used in pot-pourri, they are also used as a strewing herb. Alecost is used as a bookmark in the Bible to keep pages free from moths and fish moths and to scent it with its minty, camphor refreshing fragrance. Alecost is also said to be helpful as a moth preventative. Crushed dried leaves act as an excellent insect and ant repellent. An infusion makes a fragrant hair rinse or lotion for your skin. 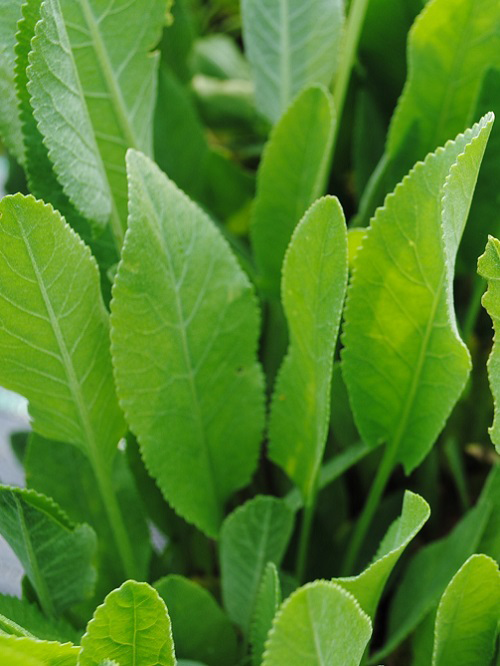 This aromatic herb has two common names, costmary and alecost. “Cost” refers to costus, a spicy Asian plant related to ginger, which has a slightly similar flavor. “Mary” refers to an association with the Virgin Mary, perhaps because it was used in medieval times as an infusion to relieve the pain of childbirth. “Alecost” translates into ale-cost or “spicy herb for ale” as it was once an important flavoring of ales. 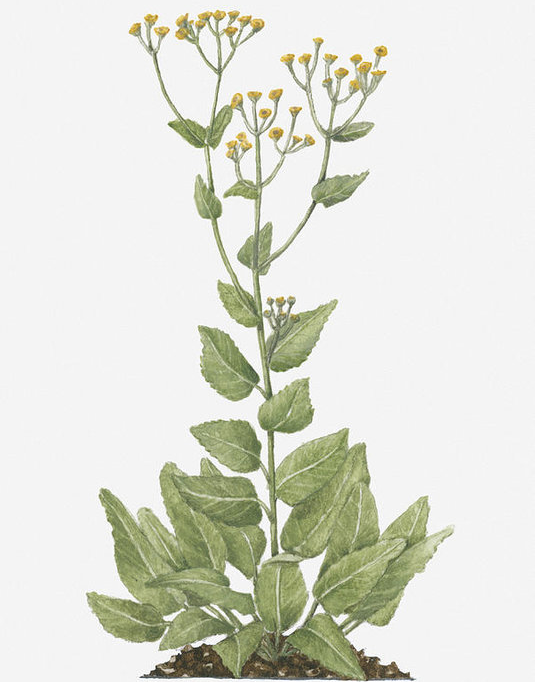 The large, oblong leaves of costmary make neat, fragrant bookmarks, a use that gives us the old names Bible leaf or Bible plant. The minty odor might help to repel silverfish or insects from the family Bible, and the leaf could be smelt or chewed secretly during long sermons to stay awake. Alecost is not suitable for use during pregnancy. Ketone content in Alecost may cause poisoning and is toxic when taken in large amounts. Chrysanthemum balsamita var. tanacetoides Boiss. Matricaria apetala Hort.Erf. ex DC. 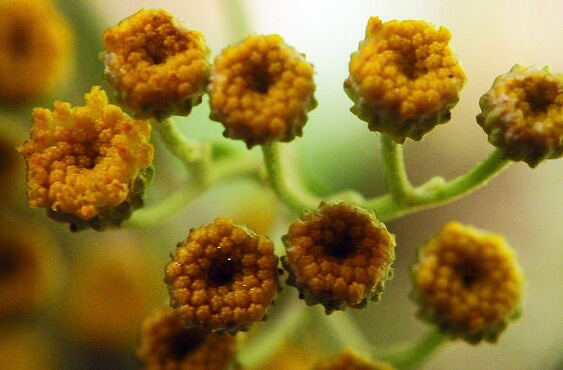 Tanacetum balsamita var. tanacetoides Boiss.